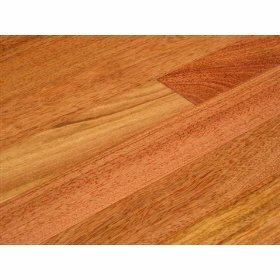 BR111 is an approximately 15 year old exotic hardwood flooring company. Their designs are exquisite, ranging from their indusparquet to their dolomites engineered product lines. BR111 is the largest flooring company in South America. They produce millions of square feet of flooring every month, to be distributed all over the world. BR111 has partners all over the world as well, including but not limited to All Tile Inc., Golden State Flooring, J.J.Haines & Company, Wood Flooring Distributors, Superior Products, T&A Distributing, and the list goes on. Over 25 species of flooring are employed in BR111's collection, with their leading product line being Indusparquet. Amendoim is a tan red/brown variation which is visually stunning. Amendoim will darken though once it is exposed to light, which will slowly change back but will take about 3 months after being installed. Angelim is a hardwood floor variation with amber highlights throughout the pattern. Somewhat of a darker pattern, the Angelim collection resembles somewhat of a cherry oak design. Simply stunning. You're looking at Angico, a variation with graining done randomly and a dark brown to blackish color. As you can see it blends in very well in a darker wallpaper/ decor setting. Keywords : Br 111 Exotic Hardwood Floors Read Solid Prefinished Hardwood Flooring reviews.